This is my little red gem. My first attraction to this appliance was that it's small and compact as far as rice cookers go. The bowl measures 8" across, is non-stick and removable for easy clean-up. It has a rice paddle, measuring cup and steamer attachment included. To use, you simply add equal amounts of rice and water to the bowl (use only the enclosed measuring cup*), cover and press cook. 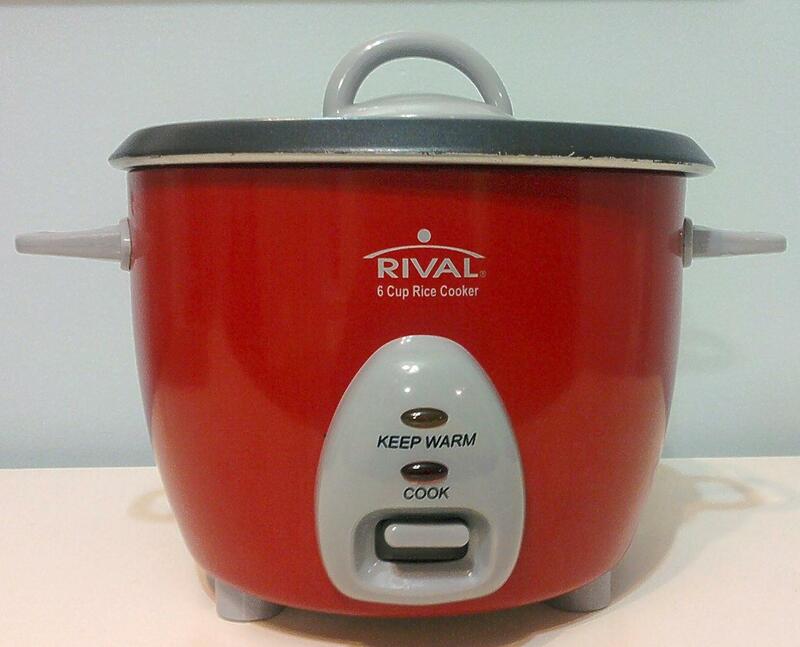 If you've never owned a rice cooker, this is perfect. It's compact size tells you it won't take over your cupboard or counter space. The enclosed measuring cup will fill 4 times creating 6 cups of cooked rice. I've had mine for nearly 4 years now, and use it 4-6 times a week. It's the head appliance here -- and knows it. * Most rice cups measure about 3/4 cups. P.S. : To steam vegetables, put a little water in the bottom of bowl, set the metal steamer part over water, add your vegetables (or whatever you're cooking) cover, and press start. Do not use steamer attachment to cook rice. Where to purchase: I got mine here.